The World Cup is here whether you're paying attention or not, America. You may be having flashbacks to the Olympics -- unsure how the game works, who anyone is, and why the men aren't smashing into each other as hard as they can -- but we promise you can find a way to enjoy the world's most popular sport. You know what'll make you feel right at home? Memes. Good old-fashioned God-fearing memes. And an errant big red balloon has given us one of the best of the World Cup so far. The Pop Heard 'Round the Internet happened at a match between Brazil and Switzerland. 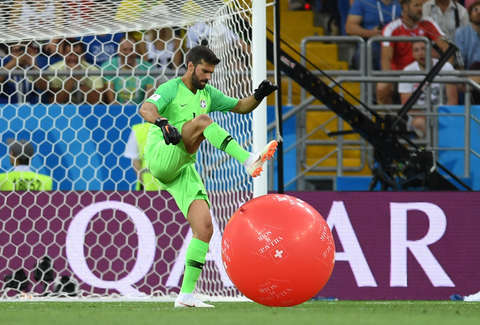 A massive red balloon floated its way down to the field (the match ended with a 1-1 tie if you care about this beyond the dank memes, by the way), and Brazilian goalie Alisson Becker took decisive action. He mercilessly stopped on and popped the balloon. And the internet was pleased. Soon, there were classic, life-is-hard-and-things-are-bad memes. There were actual soccer memes, most about where Becker will head next. Then the inevitable invert-the-premise meta-meme, which is the sign that a meme has truly made it. And finally, the use-the-inverted-premise-as-a-whole-new-meme meme. When Alisson announces his intention to join Real Madrid over #LFC. See, soccer isn't so different. Memes are the same in any sport and any country.